A lost pet parakeet has been returned safely to its owner in the Japanese capital Tokyo after it told the police its home address. The bird's owner, a 64-year-old woman, said she taught the address to her pet after she bought him two years ago. She had lost another parakeet previously and wanted to ensure that did not happen again, police said. 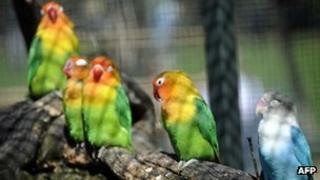 The male bird was handed to local authorities on Sunday, and took two days to tell the police its address. The bird had escaped from its owner's home in west Tokyo on Sunday. It was captured at a nearby hotel where it was perching on a guest's shoulder.